Seattle Reign FC and the Chicago Red Stars tied 0-0 on Saturday night in Seattle to close out Week 8 in the NWSL. On a rainy night in Seattle, 3,597 fans came out to UW Medicine Pitch at Memorial Stadium to see the two teams in action. The Reign sit in second place with a 4-1-2 record (14 pts). The Red Stars are in fifth place at 2-2-6 (12 pts). The game featured two of the league’s most dangerous goal scorers in Seattle’s Megan Rapinoe and Chicago’s Sam Kerr, but it was the goalkeepers for each side that came up with big plays to keep the game scoreless. In the 68th minute, Red Stars goalkeeper Alyssa Naeher tipped a Rapinoe shot headed for the back of the net over the bar. In the 42nd minute, the Red Stars had a few opportunities on a Danielle Colaprico corner kick, but Reign goalkeeper Lydia Williams was able to collect it. Early in the second half, Williams also caught a free kick from Sofia Huerta. Julie Ertz started and played 75 minutes for the Red Stars as she works back from a right knee sprain that kept her out for the first few games of the season. The Reign head to Houston on Wednesday night to take on the Dash. The Red Stars are next in action on Saturday at home vs. the Orlando Pride. Match ends, Seattle Reign 0, Chicago Red Stars 0. Second Half ends, Seattle Reign 0, Chicago Red Stars 0. Offside, Chicago Red Stars. Alyssa Naeher tries a through ball, but Samantha Kerr is caught offside. Attempt missed. 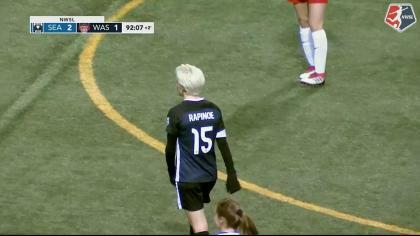 Megan Rapinoe (Seattle Reign) right footed shot from the centre of the box misses to the left. Assisted by Jodie Taylor. Attempt missed. Sofia Huerta (Chicago Red Stars) left footed shot from the centre of the box misses to the left. Assisted by Arin Gilliland with a headed pass following a set piece situation. Substitution, Seattle Reign. Beverly Yanez replaces Jessica Fishlock. Offside, Seattle Reign. Rumi Utsugi tries a through ball, but Alyssa Kleiner is caught offside. Offside, Seattle Reign. Alyssa Kleiner tries a through ball, but Jodie Taylor is caught offside. Attempt missed. Sofia Huerta (Chicago Red Stars) left footed shot from outside the box is close, but misses to the right. Assisted by Yuki Nagasato. Attempt blocked. Megan Rapinoe (Seattle Reign) right footed shot from more than 35 yards is blocked. Assisted by Rumi Utsugi. Substitution, Chicago Red Stars. Yuki Nagasato replaces Julie Ertz. Corner, Seattle Reign. Conceded by Sarah Gorden. Corner, Seattle Reign. Conceded by Alyssa Naeher. Attempt saved. Megan Rapinoe (Seattle Reign) right footed shot from outside the box is saved in the top centre of the goal. Assisted by Jessica Fishlock. Attempt missed. Julie Ertz (Chicago Red Stars) right footed shot from outside the box misses to the left. Attempt saved. Julie Ertz (Chicago Red Stars) header from the centre of the box is saved in the top centre of the goal. Assisted by Sofia Huerta with a cross. Attempt saved. Sofia Huerta (Chicago Red Stars) left footed shot from outside the box is saved in the centre of the goal. Assisted by Danielle Colaprico. Attempt missed. Megan Rapinoe (Seattle Reign) right footed shot from outside the box misses to the right from a direct free kick. Katie Naughton (Chicago Red Stars) is shown the yellow card for a bad foul. Attempt missed. Julie Ertz (Chicago Red Stars) right footed shot from more than 35 yards misses to the left. Assisted by Samantha Kerr. Attempt missed. Samantha Johnson (Chicago Red Stars) header from the right side of the six yard box is high and wide to the right. Assisted by Danielle Colaprico with a cross following a set piece situation. Attempt missed. Julie Ertz (Chicago Red Stars) right footed shot from very close range is close, but misses the top right corner. Sarah Gorden (Chicago Red Stars) wins a free kick on the left wing. Attempt saved. Samantha Johnson (Chicago Red Stars) right footed shot from the centre of the box is saved in the centre of the goal. Attempt saved. Arin Gilliland (Chicago Red Stars) header from very close range is saved in the top centre of the goal. Assisted by Katie Naughton with a headed pass. Corner, Chicago Red Stars. Conceded by Alyssa Kleiner. Attempt missed. 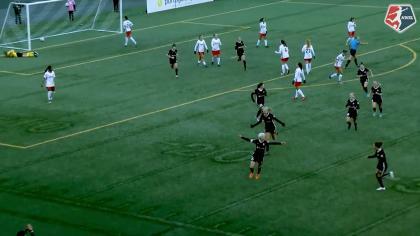 Rumi Utsugi (Seattle Reign) left footed shot from outside the box is too high following a corner. Attempt blocked. Allie Long (Seattle Reign) header from the centre of the box is blocked. Assisted by Stephanie Catley with a cross. Jessica Fishlock (Seattle Reign) wins a free kick on the right wing. Attempt missed. Jessica Fishlock (Seattle Reign) header from the centre of the box is close, but misses to the right. Assisted by Megan Rapinoe with a cross. Alyssa Kleiner (Seattle Reign) wins a free kick on the right wing. Attempt saved. Megan Rapinoe (Seattle Reign) left footed shot from a difficult angle on the left is saved in the centre of the goal. Assisted by Stephanie Catley. Attempt saved. Rumi Utsugi (Seattle Reign) left footed shot from the right side of the six yard box is saved in the centre of the goal. Assisted by Allie Long. Offside, Seattle Reign. Stephanie Catley tries a through ball, but Rumi Utsugi is caught offside. Attempt saved. Jodie Taylor (Seattle Reign) left footed shot from the centre of the box is saved in the centre of the goal. Assisted by Megan Rapinoe with a through ball. Corner, Chicago Red Stars. Conceded by Rumi Utsugi. Corner, Seattle Reign. Conceded by Samantha Kerr.